Ducks are often the most familiar types of birds to many beginning birders and non-birders, but even experienced birders or duck hunters may not know just how unique these birds can be. These duck facts are sure to surprise you! All types of ducks are part of the bird family Anatidae, which also includes swans and geese. 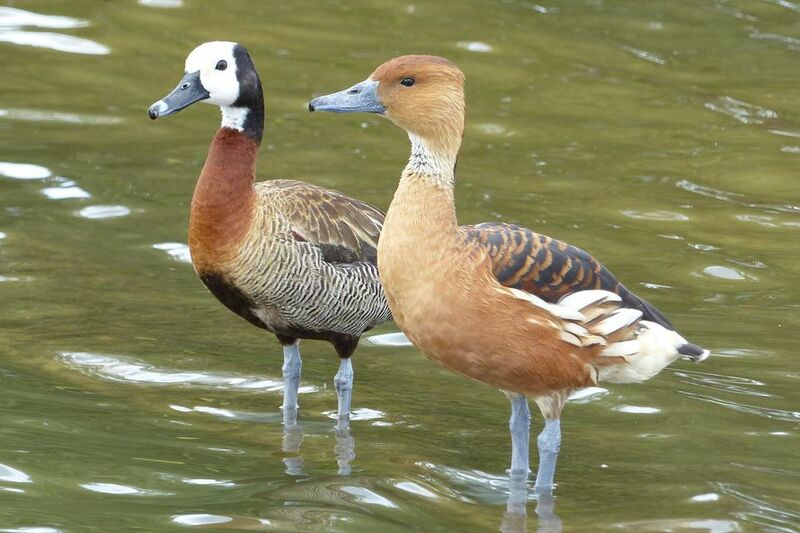 There are between 140-175 birds in the Anatidae family, depending on how different subspecies are classified, though not all of them are considered ducks. There are species of ducks found worldwide on every continent except Antarctica. Some duck species, such as the mallard, are found throughout the world, while others have very small, restricted ranges. A baby duck is called a duckling, and an adult male is a drake. An adult female duck is called a hen or a duck, and a group of ducks can be called a raft, team, or paddling. Generic terms like bird, chick, and flock also apply to ducks. All ducks have highly waterproof feathers as a result of an intricate feather structure and a waxy coating that is spread on each feather while preening. A duck's feathers are so waterproof that even when the duck dives underwater, its downy underlayer of feathers right next to the skin will stay completely dry. The uropygial gland at the base of the tail produces the waxy oil that coats feathers so well, and many other birds also have the same gland. Ducks are precocial, which means that ducklings are covered with down and able to walk and leave the nest just a few hours after hatching. This helps protect the young chicks from predators, since they do not need to stay in the vulnerable nest area for long. A hen will lead her ducklings up to a half mile or more over land after hatching in order to find a suitable water source for swimming and feeding. As soon as a baby duck's down is dry after hatching, they will be able to swim. It isn't unusual to see very tiny ducklings swimming after their mother. Male ducks have an eclipse plumage similar to females that they wear after the breeding season for about a month as their new feathers grow. During that month, they are completely flightless and more vulnerable to predators. At this time, many male ducks stay in isolated, remote areas or flock together for protection in numbers. Most duck species are monogamous for a breeding season but they do not often mate for life. Instead, they will seek out new mates each year, choosing the healthiest, strongest, best mate who can help them pass on their genes to a new duckling generation. When constructing her nest, a hen will line it with soft down feathers she plucks from her own breast. This gives the eggs the best possible cushioning and insulation, and exposes the hen's skin so she can keep the eggs warm more efficiently. Other duck nesting material includes grasses, mud, twigs, leaves, reeds, and other plant material. Ducks are omnivorous, opportunistic eaters and will eat grass, aquatic plants, insects, seeds, fruit, fish, nuts, crustaceans, and other types of food. Some ducks, such as mergansers, are more specialized in their dietary needs, but most ducks can adapt well to different food sources. This helps ensure they always have adequate food to eat. A duck's bill is specialized to help it forage in mud and to strain food from the water. A hard nail at the tip of the bill helps with foraging, and the lamellae, a comb-like structure on the sides of the bill, strains small insects and crustaceans from water. Most male ducks are silent and very few ducks actually "quack." Instead, their calls may include squeaks, grunts, groans, chirps, whistles, brays, and growls. Females can also make a wide range of different noises, and they are usually more vocal than males. It is a myth that a duck's quack won't echo. This has been conclusively disproved through different scientific acoustic tests, and was even featured as "busted" on an episode of the Discovery Channel show Mythbusters. Ducks have been domesticated as pets and farm animals for more than 500 years, and all domestic ducks are descended from either the mallard or the Muscovy duck. Mallards, especially, are easy to crossbreed with other types of ducks, and mallards often hybridize with all types of ducks at local ponds. There are more than 40 breeds of domestic duck. The all-white Pekin duck (also called the Long Island duck) is the most common variety raised for eggs and meat, especially on large commercial farms. Smaller organizations or individual farmers often try different duck breeds depending on their needs and tastes. Because of their familiarity and comic nature, ducks are often featured as fictional characters. The two most famous fictional ducks are Disney's Donald Duck, who premiered in 1934, and Warner Bros.' Daffy Duck, who premiered in 1937. Ducks have also been spokesbirds for companies or featured in advertising campaigns, and some ducks are even mascots for schools, businesses or sports teams.